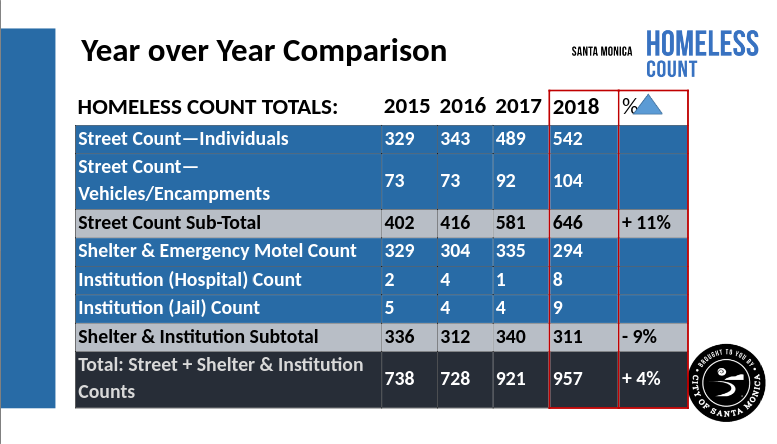 Santa Monica released the results of this year’s annual city-wide homelessness count Tuesday, showing a continued increase in the number of people struggling with homelessness in the city for the second year in a row after nearly a decade of declining numbers. Officials released the results Tuesday night at the Santa Monica City Council meeting, revealing that over the course of one night in January, volunteers counted 957 people sleeping on the streets, in their vehicles, or in shelters. That is a four percent increase over the 921 people volunteers counted in 2017, then the highest number of homeless people counted in the city since Santa Monica began its annual homelessness count in 2009. Last year’s homelessness count results saw a 26 percent increase over the previous year in the number of people bedding down on Santa Monica’s streets, in shelters, or in their cars, which reflected a countywide trend. In 2017, there were an estimated nearly 58,000 people struggling with homelessness throughout L.A. County, a 23 percent increase over 2016 numbers. The results from the 2018 countywide count are expected later this year. “With rising rents, stagnating incomes, workers disconnected from work opportunities, and neighborhoods undergoing rapid demographic change as people scramble to find affordable housing, this is truly a regional problem,” Alisa Orduna, the city’s new senior advisor on homelessness, told the Council Tuesday night. “While our Housing and Economic Development department is innovating great models to preserve housing for households at risk of homelessness and are standing in the firestorm to see through those new units of supportive housing, they cannot alone address the regional housing shortage,” Orduna said. While there are many factors contributing to the recent regional trend that is seeing more and more people experiencing homelessness, one major factor is that L.A. County’s housing shortage, which disproportionately impacts lower-income residents, has come to a rolling boil. In response to Santa Monica’s homelessness count results last year, Willis told Santa Monica Next in an email that the L.A. metro area has had a rental vacancy rate of three percent, which indicates a significant shortage of housing relative to demand. “This scarcity means that homeless [people] and very low income households are competing with middle income households for the same units,” Willis wrote. Countywide, that number is much higher, according to a survey commissioned by UCLA’s Luskin School of Public Affairs. Among those surveyed, a staggering 84 percent of those making less than $90,000 a year said they had worried about losing their homes and becoming homeless as a result, the L.A. Times reported in 2016. The 2017 countywide homelessness count drove home the point that the twin pressures of rising rents — due to a housing shortage — and wages remaining stagnant are exacerbating the homelessness crisis. The Los Angeles metro area’s extraordinarily low vacancy rate for rental housing disproportionately hurts low income people because it forces them to compete with higher income renters for the same, artificially limited pool of housing stock. This dynamic plays out with increasing intensity in the metro area’s most desirable places like Santa Monica where decades of slow- or anti-growth policies have severely restricted housing growth in a city where there is a high concentration of jobs, education opportunities, and services. The scope of the problem is staggering. 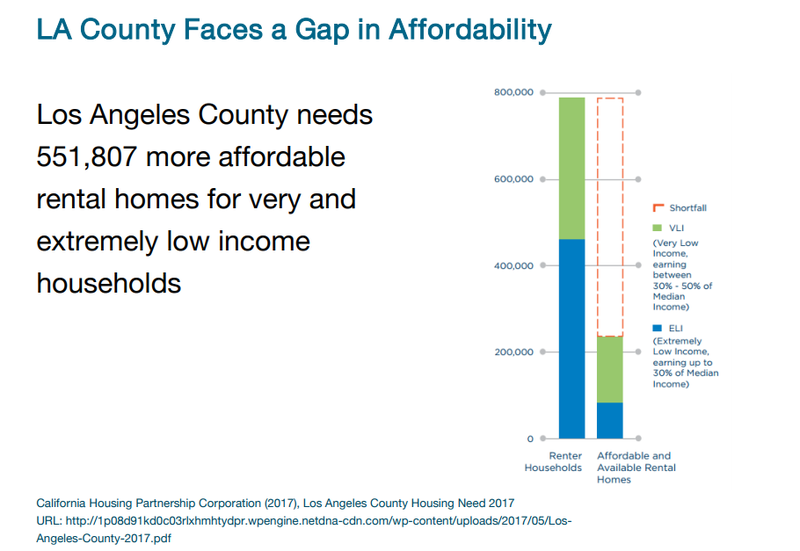 According to Los Angeles Homeless Services (LAHSA) 2017 report, there is a region-wide shortage of more than half-a-million affordable homes. Via LAHSA’s 2017 homelessness count report. Based on current rates of project approvals, it would take Santa Monica 60 years to build its share — about one percent — of the current affordable housing need. Of course, a significant proportion of people struggling with homelessness are also struggling with not only poverty but also chronic mental health issues. Making housing more affordable alone isn’t enough to help these people who also need, in addition to shelter, ongoing support services. 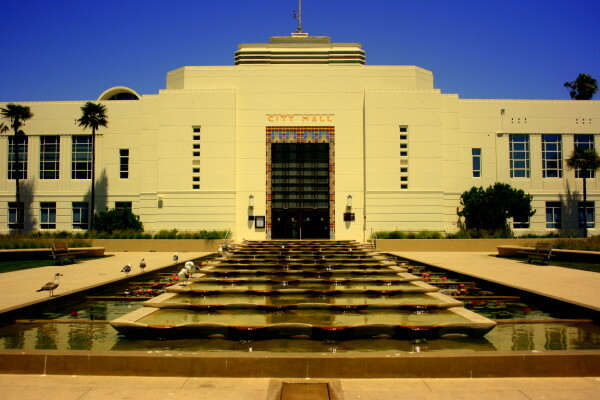 The city of Los Angeles recently passed Measure HHH, authorizing $1.2 billion in bonds to pay for the construction of permanent supportive housing. That is buttressed by the passage of the county-wide Measure H, a sales tax increase that would raise about $355 million annually to pay for services to help those struggling with chronic homelessness. But implementation is slow and neighborhood resistance to supportive housing remains just one of many obstacles. Still, at Tuesday’s meeting Senior Marketing Manager Erin Taylor noted that a new push by the United Way of Greater Los Angeles will be launching Friday to help build momentum and support for Measure H-funded programs and services. In the meantime, Santa Monica’s strategy includes a more coordinated interdepartmental approach that aims to connect those people experiencing homelessness with services and educate residents about how to engage with homeless people, but without adequate affordable and supportive housing in Santa Monica and the rest of the region, it won’t be enough.